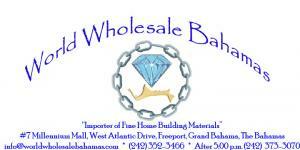 World Wholesale Bahamas is a world-class provider of Fine Home Building Materials throughout the Bahamas! We are an established company with an excellent track record for the best customer satisfaction. We have never compromised on the quality of our products and services provided to our customers. We believe in keeping the customers happy and providing them with products at a very competitive price. Our knowledgeable staff will guide you through the selection and purchase process with ease and inform you about market trends. Ask about how you can save on power bills with our Solar Water Heaters or how you can protect your family against hurricanes with our best and most technologically advanced hurricane shutters!